If you’re searching for business furnishings that will modernize the look of your company’s office in Alpharetta, Woodstock, Sandy Springs, or any other Atlanta, GA, community, but won’t break the bank, turn to NorthPoint Office Furniture. 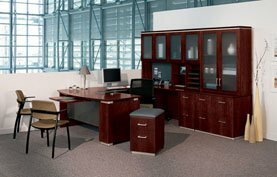 We sell a wide array of office furniture from some of the most respected names in the industry, including Cherryman, DMI, Global, HON, Martin Furniture, and others that will look great for years into the future. Whether you’re looking for classic, all-wood designs, or you’re interested in contemporary, ergonomic furniture, you’ll be able to find what you’re looking for at our beautiful showroom in Roswell. We have full displays of all of the business furnishings we sell so that you can touch, sit at, and feel the furniture we sell, and our displays will help you picture how the furniture we offer will look in an office setting. When you make a purchase from NorthPoint Office Furniture, we can deliver your business furnishings and we’ll also assemble everything for you at no additional charge. As a family-owned and -operated company, we strive to provide outstanding customer service and will work personally with you to make sure you are completely satisfied with the office furniture you purchase. Contact us today or visit our beautiful showroom in Roswell, GA, to learn more about the business furnishings we offer for companies in Alpharetta, Woodstock, Sandy Springs, and other nearby Atlanta, GA, area communities.